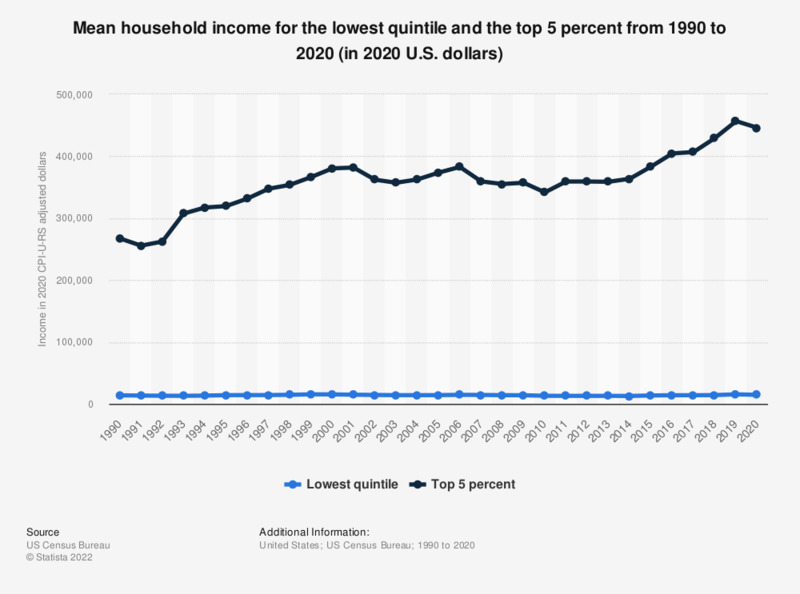 The statistic shows the mean household income for the lowest quintile and the top 5 percent workers in the United States from 1990 to 2017. In this period, the mean household income for the low-paid workers in the lowest quintile went from 13,072 to 13,258 U.S. dollars, while the mean income of the top 5 percent increased from 253,112 to 385,289 U.S. 2017 dollars. The income for this period is based on the 2017 U.S. dollar value. Income in 2017 CPI-U-RS adjusted dollars. Beginning with 2010, standard errors were calculated using replicate weights.